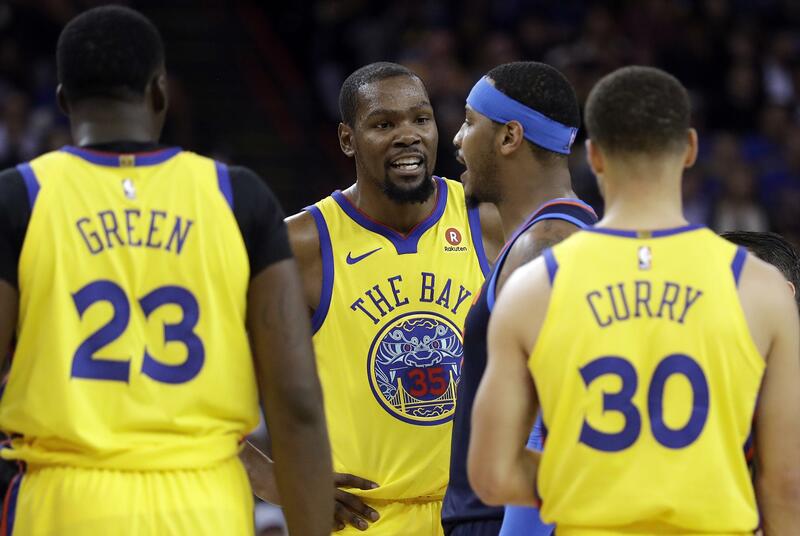 OAKLAND, Calif. – Kevin Durant scored 28 points for Golden State while avenging an embarrassing home loss to his former Oklahoma City team earlier this month and another on the road in November, leading the Warriors past the Thunder 112-80 on Saturday night. Stephen Curry added 21 points, nine rebounds, six assists and three steals as Golden State put on the kind of defensive performance coach Steve Kerr has been seeking from the defending champs. Russell Westbrook had 15 points, 12 rebounds and seven assists for Oklahoma City, which failed to reach 100 points for the first time in the last five games. The Thunder had scored at least 100 in 14 of their last 16. Durant’s pretty layup off a perfect pass by Curry with 3:06 left in the third put the Warriors up 75-66. That was part of a 37-11 Golden State run that included 30 points over the final 8:48 of the third. MINNEAPOLIS – Jeff Teague scored 25 points, Andrew Wiggins added 23 and Minnesota won its first game since All-Star Jimmy Butler was injured. Karl-Anthony Towns had 22 points and 13 rebounds for his 53rd double-double of the season. Jamal Crawford scored 19 for the Timberwolves, including three 3-pointers that keyed a 16-2 spurt to open the fourth quarter. Zach LaVine scored 21 to lead the Bulls in his return to Target Center after the blockbuster offseason trade that sent Butler to Minnesota. Butler had to be helped off the floor Friday night in a loss at Houston. He has a meniscal injury to his right knee, and it’s unclear how long he will be sidelined. SALT LAKE CITY – Donovan Mitchell had 25 points, five rebounds and five assists, and the Jazz earned their 12th win in 13 games. Derrick Favors scored 14 points for Utah (31-29), which had won 11 in a row before Friday night’s 100-81 loss to Portland. Rudy Gobert added 13 points and 10 rebounds. J.J. Barea scored 17 points for lowly Dallas, and Dirk Nowitzki had 12 points and 10 rebounds. The Mavericks (18-42) lost for the 14th time in 18 games. After tying it up three times in the fourth quarter, the Mavericks finally took an 87-85 lead on a jumper from Barea. But Utah answered with an 8-0 run, punctuated by a Gobert dunk, to go ahead 93-87 with 2:32 remaining. PHOENIX – Damian Lillard scored 40 points, including a left-handed layup with .9 seconds remaining, and Portland rallied from 15 down in the final 7 1/2 minutes to hand Phoenix its ninth straight loss. Lillard, who scored 19 points in the fourth quarter, got the final chance because Phoenix’s Troy Daniels couldn’t get the ball inbounds on a five-second call that turned possession over to Portland with 20.6 seconds to play. Devin Booker scored 30 points for the Suns, losers of 14 of their last 15. NEW YORK – Kyrie Irving had 31 points, nine rebounds and eight assists, leading the Celtics to their second victory in two nights since the All-Star break. Irving scored 15 points in a dazzling third quarter and then helped Boston finish it off with his passing in the fourth, highlighted by a behind-the-back dish to Jaylen Brown for a dunk that made it 115-106. Trey Burke scored 26 points for the Knicks, but they couldn’t win this one after beating Orlando on Thursday to end an eight-game skid. PHILADELPHIA – Joel Embiid had 28 points and 14 rebounds, and Philadelphia extended its season-high win streak to seven. Six 76ers scored in double figures. Ben Simmons had 17 points and seven assists, and J.J. Redick added 16 points on 6-for-8 shooting. The Magic have dropped five in a row. Aaron Gordon had 20 points, seven rebounds and seven assists, and Evan Fournier scored 16 points. MIAMI – Tyler Johnson scored 23 points to lead six players in double figures, and Miami stopped a three-game slide. Justise Winslow scored a season-high 17 points for the Heat. Reserve Wayne Ellington went 5 for 10 from 3-point range and scored 15. Andrew Harrison scored 17 points for the Grizzlies, who played without leading scorer Tyreke Evans. He’ll undergo a precautionary MRI Sunday on his injured right ribs. SACRAMENTO, Calif. – Kentavious Caldwell-Pope scored 17 of his season-high 34 points in the third quarter, and the Lakers snapped a three-game road losing streak. Caldwell-Pope hit eight 3-pointers and the Lakers had 17 overall. Isaiah Thomas added 17 points in his fifth game since Los Angeles acquired him in a trade with the Cleveland Cavaliers. Published: Feb. 24, 2018, 10:20 p.m.